4th year Pic 337- Apr - 16 2013. 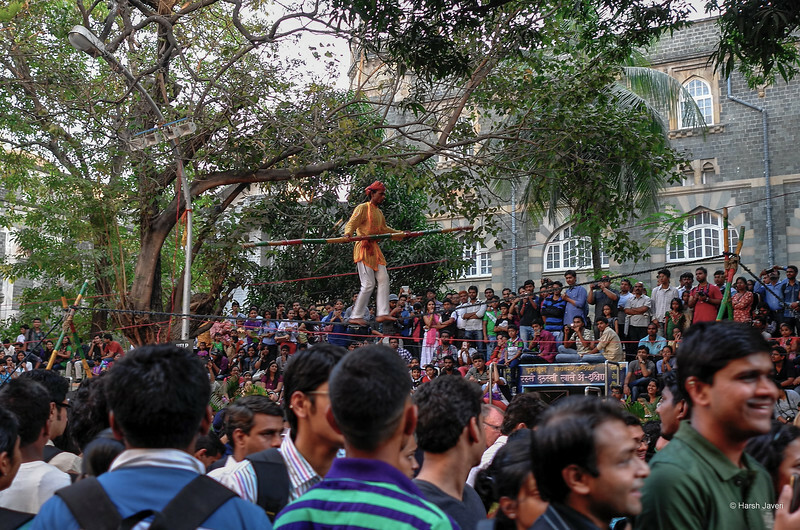 Tight rope walk - Kala Ghoda festival, Mumbai Critiques welcome! Best viewed in large size! Don't know about others but my pictures are still targeted regularly. Yesterday's shot was pushed WAY below others with FAR less comments. On top of that, some MORON has commented, "Hershy & Dubin are the same person - called mulitple accounts under fake names" !! http://smu.gs/YZnVjU [Dublin: Arnold Dublin] HOW STUPID / ENVIOUS can a person get?? Totally stunning ! Sorry for the moronic activity here. I love your work! Wonderful image; love the dof and all the terrific detail. Great job on the pp! This is a wonderful street scene Harsh, love the action & the looks on the faces of the people in the crowd. I don't know if you saw my rant the other day, but I've been having the same issues with stupid Guest comments. How petty and ridiculous can a person be. Really - Arnold & Harsh the same people.........give me a break. I say to that person, "Get a life"
Excellent street capture, lots to see! Fun capture - great find! Nice capture of the crowd and performers - Obviously a typical Florida scene!!!! Love this. It has a sense of theater on two levels...the tight rope walker performing, and in a sense the crowd 'performing' for photographers and people watchers in general. The comment about you and Arnold Dubin being the same person is so comical as to be totally devoid of credibility, even to the casual viewer who hasn't followed your respective posts on smugmug. I'm amazed that someone would want to invite the level of contempt that such behavior earns them. Nice shot and crowd action!